Why Mulch? (Maintenance-March) Freshly laid mulch is just as much a part of spring as warm sun and budding flowers. It is easy to take the mulching process as a given without giving much thought to the reasons why we do it. To begin with, mulched beds simply look nice. 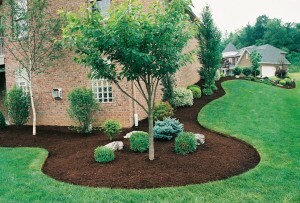 Mulch gives your landscaping a clean look that highlights your plants and flowers. Mulch spread across a plant bed gives the area a uniform look and makes the flowers in it 'pop' with intense color when contrasted against the backdrop of a layer of dark mulch. But the visual benefit of mulch is just one reason to make it part of your annual routine. Trees, shrubs and flowers are not the only plants that want to grow in your beds. Quality soil, sunlight, and water are incredibly attractive to weeds who would love to crowd out your flowers and landscaping. By eliminating exposed soil, mulch makes it hard for unwanted weed seeds to take root. The seeds that do make it to the soil are blocked off from air and water, making any growth very difficult. The heat and drought of summer can be a real struggle for your landscaping. Mulch blocks the intense sun, cooling the soil and making it more hospitable for your plants. When watering, mulch soaks up water and will hold it, allowing it to be absorbed into the soil as opposed to drying up or being lost as runoff. Of course, to get all of these benefits, proper application is important. The total mulch depth should be no more than 4”, and mulch should not be piled up against trunks and stems. This subjects stems to constantly moist conditions, which can encourage disease development. There’s no time like the present for a mulch application. For help contact Moyers Lawn Service and Landscaping today for a free estimate. Your plants will thank you for it!